Heat oil in a skillet or wok set over high heat. When it shimmers, add garlic and garlic/ginger paste, then bok choy, and stir-fry for 2 minutes. 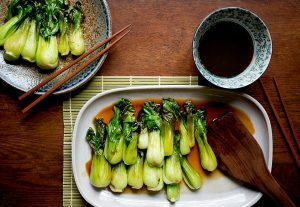 Add reserved sauce over the greens to the skillet or wok, then cover it and allow to cook for 3 to6 minutes more, until bok choy has softened nicely at its base. Rinse and peel potatoes. Slice thinly (we used a mandolin set to 1/8-inch thickness) and soak slices in cold water to remove excess starch. Melt butter in a large skillet over low heat and sauté garlic for 1-2 minutes, or until fragrant. Remove potatoes from water and pat dry with a paper towel. 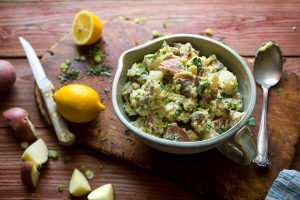 Place dry potatoes in a large bowl and pour 3/4 garlic butter over them, reserving the rest for later use. Season generously with salt and pepper and toss until everything is evenly coated. Add oil to the skillet and heat until it’s shimmering and ripply. 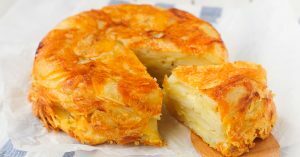 Remove pan from heat and add potatoes in a spiral formation; the potatoes on the bottom of the skillet will be the top of the “cake.” Once all the slices are in the pan, press it flat like a cake. Place pan over low heat and cover with a lid for 15 minutes, adding the remaining butter and loosening the edges as the cake cooks. Wipe away moisture that collects on the lid occasionally so the potatoes get crispy as they cook. Lift edges of cake and check that it is browned; potatoes should be fork tender. Invert cake onto a large plate. Add more oil to the pan if necessary to keep the cake from sticking. Slide the cake back into the pan with the unbrowned potatoes on the bottom, and cook an additional 15 minutes until golden brown. Cut cake into wedges and serve hot. For the Cauliflower Rice: In the bowl of a food processor fitted with a blade attachment, add the cauliflower florets, and pulse until finely chopped. 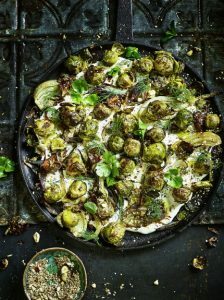 In a large skillet pan over high heat, add olive oil and cauliflower and cook for about 3 minutes, or until tender, stirring occasionally. Season with salt and pepper to taste. 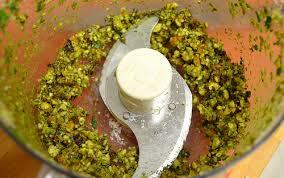 For the Swiss Chard Pesto: Clean the bowl of the food processor and blade attachment and add the garlic into the clean bowl. Pulse garlic to chop. Add swiss chard, walnuts, grated parmesan, and parsley and pulse until finely chopped. Scrape down the inside of the bowl with a rubber spatula. With the food processor running, add the oil, salt and pepper and process until smooth. 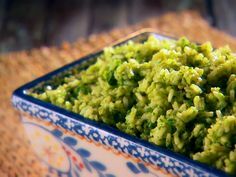 To Assemble: Pour the pesto over the cauliflower rice and mix together in the skillet. Remove the cauliflower to a serving platter. Garnish with shaved parmesan and parsley leaves. Tip: Prep the recipe in advance! 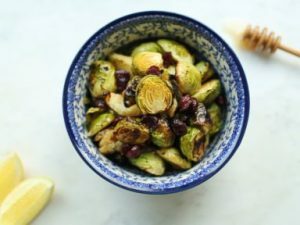 Cut the cauliflower, make the pesto, and salt the chicken the day before to make for a quick and easy meal the next day! Trim and scrub the carrots. If the carrots are more than 1 inch in diameter, cut them in half lengthwise. Cut the carrots in large diagonal slices 1 inch wide 2 inches long (they will shrink when they roast) and place in a medium bowl with 1/4 cup of olive oil, 1 teaspoon salt, and 1/2 teaspoon pepper. Toss well and transfer to two sheet pans. 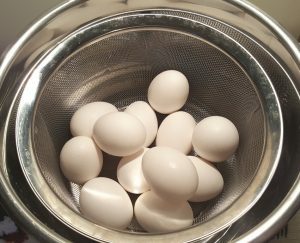 (If you use just one, they’ll steam instead of roasting.) Roast for 20 minutes, tossing once, until the carrots are tender. Transfer all the carrots to one of the sheet pans, add the maple syrup, toss, and roast for 10 to 15 minutes, until the edges are caramelized. Watch them carefully! Toss with a metal spatula and set aside for 10 minutes. In a small bowl, combine the vinegar, garlic, and 1/2 teaspoon salt. Whisk in 3 tablespoons of olive oil. 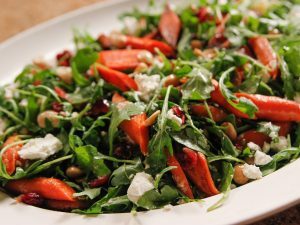 Place the arugula in a large bowl and add the carrots, cranberries (with their liquid), goat cheese, almonds, and the vinaigrette. 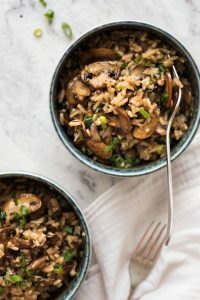 Toss with large spoons, sprinkle with salt, and serve at room temperature.